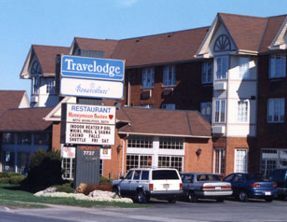 The Travelodge Niagara Falls Bonaventure is situated only a short drive from the Falls and all of the major attractions offered in the tourist district. This 3 Diamond Property is located on historic Lundy’s Lane, a 5 minute walk from the Canada One Factory Outlet Mall. The Travelodge Bonaventure offers great amenities indoor and outdoor heated pools, whirlpool and sauna, pay per view movies, Nintendo video games, cable television, and wireless Internet. A wide variety of rooms are offered, including standard guestrooms for family vacations and jacuzzi rooms for the romantic getaways. Ideally located on historic Lundy’s Lane, the Travelodge Niagara Falls Bonaventure offers guests a full range of affordable conveniences. From spacious guests rooms and honeymoon suites for the romantic adventure, the Sleepy Bear Honor Roll Property ensures comfort and quality during your stay. Guest rooms offer Queen and Double Size Beds and feature cable TVs, movies on-demand, video games, coffeemakers, hairdryers, data ports, wireless Internet access, telephones, climate controls, work desks, and free local calls. Guests can also enjoy the indoor and outdoor heated pools, whirlpool and sauna. Off site amenities include nearby dining, shopping and major attractions around the Horseshoe Falls. Some of the major attractions include the Canada One Factory Outlet Mall, Casino Niagara, and Niagara Parks Attractions. Conveniently located in the lobby level of the hotel, the Bonaventure Restaurant offers guests with great food and amazing service. This Niagara Falls Restaurant is a local favorite known for its all-around quality located next to the Travelodge Bonaventure Hotel. Relax in the dining room, hang out at the bar, or kick back on the outdoor patio. Try out some of the best appetizers, amazing entrées, and desserts worth remembering at Mick & Angelo’s.